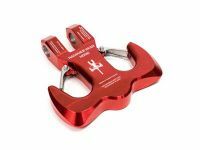 The BOLT Off-Vehicle Coupler Lock can be used to secure your boat or trailer when it isn't attached to the vehicle, prevent thevies from simply connecting your trailer or caravan and driving off. Please select the Off-Vehicle Coupler Lock for your vehicle or if you don't want to use your ignition key, BOLT Lock Australia provides the Key for FREE with your purchase of the BOLT Key Range. The GMC & Chevrolet Off-Vehicle Coupler Lock is compatible with the Chevrolet - Avlanche, Blazer, Camaro, Corvette, Silverado, Suburban, Tahoe Keys and the GMC - Sierra, Yukon Keys and the Cadillac - CTS and Escalade Keys. The Jeep Off-Vehicle Coupler Lock is compatible with the Jeep - Cherokee, Commander, Compass, Grand Cherokee, Patriot and Wrangler.